President George Bridges writes about the people he’s met at Evergreen since his arrival. Nani Paape explores how Evergreen’s activist roots help grads address climate change. Rhys Roth ’87, MES ’90 maps out new energy investments for a cleaner, brighter future. Tim Ball ’80 and Christy Holz ’78 talk private enterprise and the future of solar. Nuclear Energy: Part of the Problem, Solution, or Both? ﻿International nuclear power economist Geoffrey Rothwell ’75 weighs in. Evergreen installs sixth president George Bridges with ceremony and celebration. Lynn Helbrecht ’87 forms alliances to protect wildlife while tackling climate change. Climate and Energy: Influencers and Advocates. Page through the print edition of the magazine with our interactive flip-book. 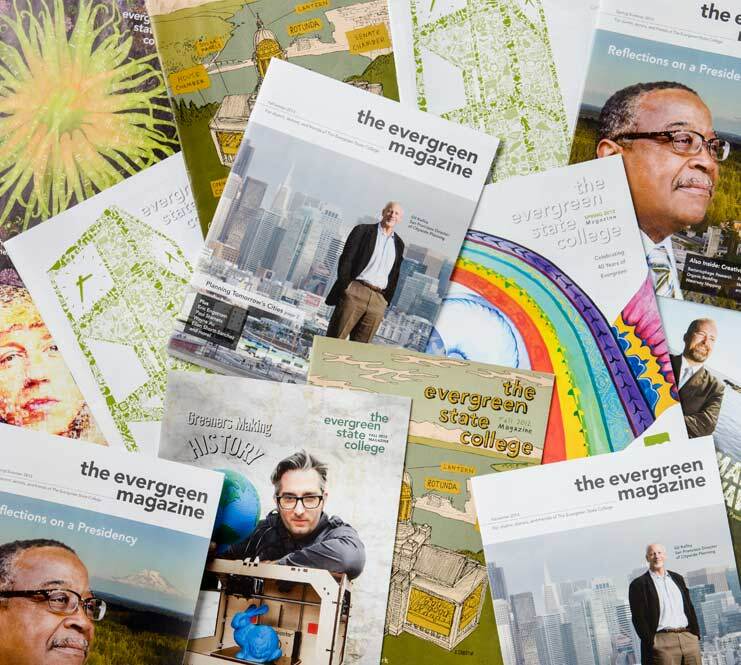 If you want Evergreen Magazine in your hands, send us your contact information and we’ll get the next one delivered straight to you. Return to the Evergreen you remember. Explore our interactive photo and then taste, touch, hear, smell, and see Evergreen through the five senses at Return to Evergreen.